Established in Harajuku by then 22 year old designer Sebastian Masuda in 1995, 6%DOKIDOKI has come to symbolize Tokyo’s colorful youth culture district. The shop initially stocked imported US and Mexican items, but within about three years Masuda started to design his own brightly colored original creations ranging from accessories to clothing and interior design items. The things Masuda sold helped influence the Decora look, a style that was truly born on the street and a pure Japanese invention. Flouncy skirts were combined with colorful knee socks, t-shirts and hoodies, and heaps of accessories, often home-made from ribbons, toys, and even curtains. 6%DOKIDOKI designs are easily recognizable by their design and the shades of vivid yellow, pink and purple that Masuda likes to use. Combined with stars, hearts, ribbons, unicorns and ice cream cones, this results in ultra-kawaii items that have become representative for Japanese pop culture. Masuda believes that fashion is a form of communication and can bring people together. He expresses this in his designs. A good example is the 6%DOKIDOKI arigatou earring that spells out thank you in colorful Japanese characters hanging from the ear all the way down to the shoulder. Someone unfamiliar with Japanese, is bound to ask the wearer what it means, explains Masuda. He often explains that fashion gives young people a voice. 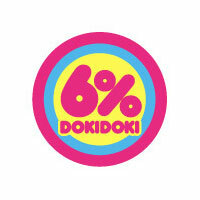 According to the designer, 6%DOKIDOKI’s bright colors are a statement against war. One of the accessories he designed features the Japanese characters for revolution (革命, kakumei). Masuda has influenced a large number of Japanese artists, with Kyary Pamyu Pamyu probably being the most visible and well-known outside the country. Masuda was the art director of her video PonPonPon. 6% Dokidoki shop girls Vani and Yuka have travelled worldwide to spread 6%DOKIDOKI’s message of kawaii cool, and in the process have become celebrities in their own right. I’d wish there were brands like this one here where I live. Sadly, the only way to get vibrant clothes like that is to look around constantly through every store available [even the cheapy stores are considered here] to find items that resemble 6% Doki Doki style. @HaasiD: How about buying things online?